Children love to paint, especially the younger ones who will paint through a stack of paper in a few minutes. There’s only so much room on a fridge and even if you recycle it as wrapping paper, you will probably find you have more than enough. Here are a few ideas to use up your children’s paintings and turn them into new art! Glue two full size dry paintings back to back. Angle the corners to make a large kite. Glue crepe paper streamers to the kite bottom for the tail. Punch a hole in top for string to fly your colourful kite. Instead of a kite shape, after the paintings are together, fold in half and cut out half a butterfly shape, or one wing. When open the butterfly will be symmetrical. Add a crepe paper streamer tail and fly or hang the butterfly to move in the breeze. 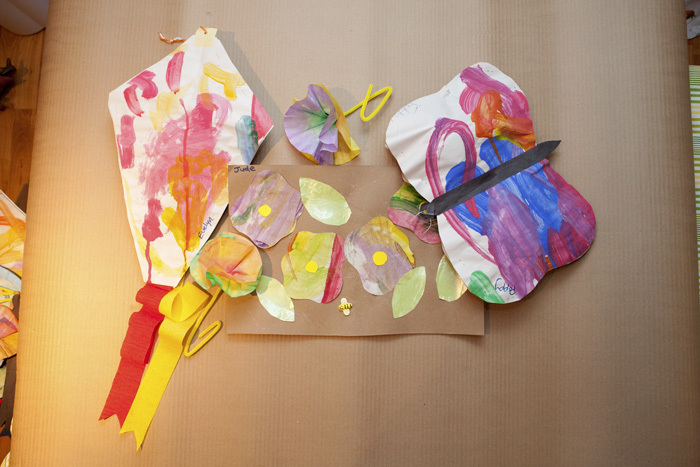 You can make beautiful flowers by cutting up the paintings into simple flower shapes to be glued onto paper. Use coloured construction paper, cardboard or even corrugated cardboard as the garden background. Add some paper leaves and even a little bug or two. Eric Carle, author/illustrator of numerous children’s books like The Very Hungry Caterpillar, uses this same technique and the results are lovely. When they tire of using up their paintings try making a beautiful flower from a basket coffee filter. The coffee filters are very absorbent. Drip diluted watercolour paints or even food colouring onto the filter, and the colours will grow and bleed into each other creating new colours. This is a good activity to help children discover what happens when primary red, yellow and blue mix together. Let the filters dry. Each flower needs two filters, two beads, a pipe cleaner and an egg carton cup that has been painted. With a needle carefully poke a hole through the centre of the coffee filters and the eggcup. Place a dab of glue on the outside of the eggcup and inside as well. Thread the pipe cleaner through a bead, then through the eggcup, the coffee filters and finally one more bead. Hook the end around the bead to secure and gently pull pipe cleaner back down into base of egg cup. The glue will hold everything in place. Carefully arrange the filters, pulling them apart for petals. Bend the end of the pipe cleaner to make a stem and leaf. One is nice but a whole bouquet is nicer! Storytellers for Children Presents : The Three Wishes Festival. On Friday June 9, from 10 to 11 a.m., hear children’s musician and Juno Award winner Kathy Reid-Naiman (Tickles & Tunes) in concert, performing for toddlers, preschoolers to primary-aged children. Later in the afternoon, from 1:30 to 2:30 p.m., hear Toronto storyteller and author Dan Yashinsky’s Village of Storytellers for JK/SK and grades 1 to 6. The festival takes place at Pegasus Studios, 361 Glebeholme Blvd., northeast of Danforth and Coxwell. Call 416-699-2608 for info. Schools are welcome and should pre-book.